I’m writing strategy on how to prepare for All India Civil Service Coaching Centre Entrance Exam just because of getting lots of e-mails asking me how to prepare for All India Civil Service Coaching Centre Entrance Exam, Chennai. I can’t say I’m an expert in clearing this entrance exam. As I’m a full-time civil service aspirant for three years and have cleared this entrance exam I guess reasonably I’m qualified to write about this entrance exam. Reviewing their last three years question paper will make us clear on what they are expecting from the aspirants. Related Post: All information on AICSCC. Like UPSC, All India Civil Service Coaching Centre will also surprise us by asking unexpected questions. But the standard of those questions won’t be like that of UPSC. AICSCC will ask for factual questions like TNPSC. whereas UPSC will be asking conceptual questions. Eg: there won’t be questions on parliamentary functions instead questions will be like. Which article ensures Right to Religion? Tribunal Comes under which part? Who said that preamble is the key to the constitution? There will be a few conceptual questions under Economics for which we need to read the newspaper and at least, one economics textbook. 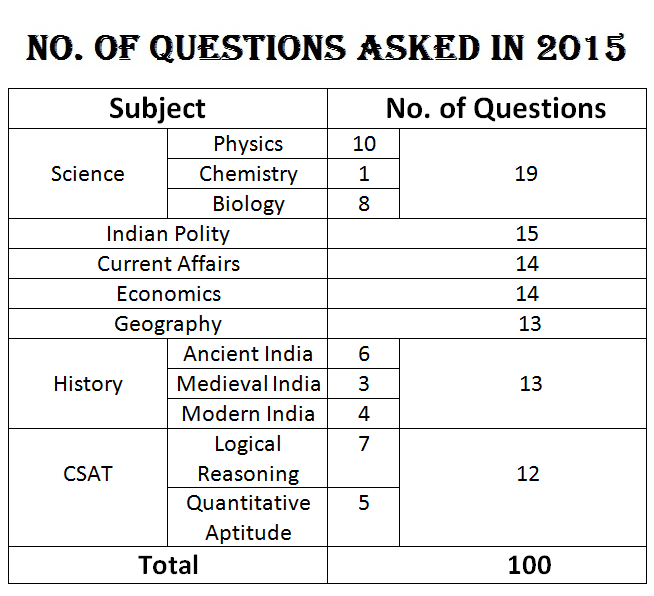 I have attached the number of questions asked in 2013, 2014, 2015 entrance exams. These tables do not answer your question on How to Prepare for All India Civil Service Coaching Centre. But looking at these tables clearly shows that the number of questions asked from each subject changes by year to year. But every year the question papers contains more of questions from Biology, Political Science, Economics and Geography. So if you are mastered in any of the three subjects from this you can crack the entrance exam. Note that you would need at least 90 marks to get selected. Each question carries 2 marks and there are no negative marks so you should get 45 correct answers if you belong to OBC. The First answer to the question How to Prepare for All India Civil Service Coaching Centre Entrance Exam is by looking at previous year question papers. I have attached last 4-year question papers. The answer keys are also available with these question papers. All India Civil Service Coaching Centre Entrance Exam Question Paper 2013. All India Civil Service Coaching Centre Entrance Exam Question Paper 2014. All India Civil Service Coaching Centre Entrance Exam Question Paper 2015. All India Civil Service Coaching Centre Entrance Exam Question Paper 2016. All India Civil Service Coaching Centre had published results of Entrance exam 2015 with the marks scored by them. Every year there will be 15 questions from Indian Polity. As I have mentioned earlier many questions are not based on concepts but only on facts so study Article number. Buy Indian Polity – M Lakshmikanth (Must buy for UPSC Civil Services Preparation). In Indian Polity – Lakshmikanth study some important chapters. Be thorough with Chapter 2 – Making of the Constitution. Memorize all members and chairman of Major Committees, Minor Committees and Drafting committee. Chapter 3 -Salient features of the Constitution is an important chapter. Read table 3.1 repeatedly and try to remember the parts, subject matter and articles. If you find difficult to memorize even after many revision just memorize the parts. So that you can guess the answer. For UPSC you need not memorize these articles but repeated reading and exams will make us remember. Memorizing these articles and subject matter will be useful for TNPSC Group 1 and Group 2 exams. In TNPSC Group I question many, questions were from this table. Table 3.2 is also important and that list outs important articles and its numbers. Table 3.3 which lists all twelve schedules. Study all those schedules. Table 3.4 which contains the sources of the constitution of India. You have to memorize this table too. But don’t memorize all features borrowed. Read amendments given in Appendix of the book. Some important amendments are – Amendments to give statehood, last 10 amendments, Amendments of 1, 6, 7, 24, 25, 42, 44. Study some important features like Fundamental Duty, Fundamental Right, Concurrent List, Directive Principles of State Policy, Federation with a strong centre, the procedure established by law, the procedure for amendment, Liberty, Equality, fraternity etc. Just go through the chapters of Union and its territory, Citizenship. Fundamental Rights are important so study that well. Fundamental Duties and Directive Principles of State Policy are equally important. Read those topics well. There may be some conceptual questions from the Amendment of the constitution. So study the 3 types of amendment procedures. The chapters I have mentioned above are very important and by studying these limited content you can score much. If you have finished these topics and have plenty of time to learn then read chapters like Parliamentary System, Emergency Provisions, President, Parliament, Supreme Court, Governor. Keshwananda Bharathi case, Shankari Prasad Case and the Berubari Union case are some important cases with historical judgement. Read basic economic definitions from Indian Economy Key concepts by Shankar Ganesh IRS. (An Alumni of AICSCC). Questions from the Economic survey, Newspaper were unpredictable. It is better to revise some exam questions papers conducted very recently – UPSC Civil Services Examination Question Paper, UPSC CDS question paper, TNPSC Group 1, Group 2 Question Paper. Book to but for intensive civil services exam preparation is Indian Economy – Ramesh Singh. Questions will be from Biology. Read Samacheer Kalvi Biology book. For more go through previous year question papers. you can find that the questions will be from recent diseases like swine flu, Ebola. For science and technology recent missiles by DRDO, Submarines and launched satellites by ISRO are important. So the questions cover both Current affairs and science. Questions will be from NCERT books. Download important Old NCERT books. Ancient India is important. Read about Jainism, Buddhism, Ashoka, Gupta. Last year History was given importance because many numbers of questions in UPSC questions were from Indian Culture. Many Questions will be from Times of India. Better read Jagran Josh current affairs. Solve CDS question paper. Read about recent Yojanas in GkToday. Read current affairs before the month of October. Some audio Notes for Current affairs are also available. I have added the recent current affair notes sent by Rajabhoopathy sir through WhatsApp. He gave this notes for TNPSC Group 1. But it is useful for AICSCC entrance exam too. For the last two years there were questions from aptitude and reasoning but now there may be questions from CSAT because UPSC has made CSAT just as a qualifying paper. The number of questions might drop down from 20 to 10. You need not memorize any formulas. Questions will be easy and can be solved without formulas. In their official notification for this year, they haven’t mentioned CSAT in the portion so, I guess they won’t ask any question from aptitude or reasoning. The final suggestion by me for the question How to Prepare for All India Civil Service Coaching Centre Entrance Exam, aim for clearing UPSC Prelims. You will clear this entrance very easily. All India Civil Service Coaching Centre Entrance Exam Question Paper 2013 with Answer Key. All India Civil Service Coaching Centre Entrance Exam Question Paper 2014 with Answer Key. All India Civil Service Coaching Centre Entrance Exam Question Paper 2015 with Answer Key. All India Civil Service Coaching Centre Entrance Exam Question Paper 2016 with Answer Key. About All India Civil Service Coaching Centre. The complete Booklist to read for UPSC Exam is available here. Hello sir when will they publish the results and when will the classes will commence ????? What kind of teaching will be there do they start from basics again or test series. Do they take optional classes??? Thank you sir.. For ur brief discussion. I m just confused on what I m studying ,how to prepare, which book I have to refer. Plz give me mail ID.. Further doubt I ll clear with u.
last year they didn’t release the final key…. 1.Cirro-stratus clouds can cause halos. 2.Cirro-cumulus clouds are known as makeral sky. 3.Alto -stratus clouds make the sun appear dull. 4.Cumulo-nimbus clouds are associated with cyclonic rains. Answer (option D) – all of them correct . Sir there is negative mark for wrong answers. THANK YOU SIR, FOR YOUR BRIEF DISCUSSION. BUT SIR, WHICH OF CLASSES NCERT BOOKS ARE TO BE STUDY FOR AICSCC ENTRANCE EXAM? Sir, how can i take notes from NCERT books. Please say how the notes are taken from NCERT books? Now I am studying in college 1st yr .my dob is 04.09.99.can I write the entrance exam in the coming yr. I would like to join a coaching class. Thank u sir ,for ur brief discussion.in which class of ncert book I will read and focus mainly. Please send me a reply to my mail. sir,when aicscc entrance exam date will be announced? current affairs, from which month to start reading for this entrance exam sir?